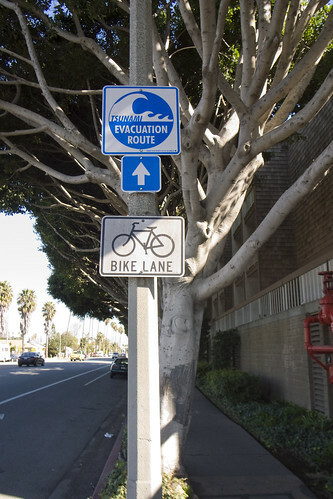 Tsunami Evacuation Route on Washington Boulevard at the border — basically 60 degrees North-North-East, directly opposite the coastline in the other direction, but essentially only a few meters above sea-level for a good couple of miles. Last week, when there was that earthquake in Samoa, we happened to be talking about Tsunamis in the studio — thinking about the ways that the California coast could be gobbled up in an unfortunate, epic disaster. It’s a distinct possibility, and with the Pacific Ocean popping off earthquakes with increasing frequency (or so it seems..), it makes one think about what sort of early warning system could be put in place — and one that would not rely too much on quite fallible technology-based networks. These are the things that typically fail even without a disaster at hand. (For instance, at the Venice Beach Music Festival a few weeks ago, with a relatively smallish contingent of people occupying Abbot-Kinney Boulevard, me and those I was with were hard-pressed to get a cell signal. If you have all of Venice Beach panicking because of an approaching Tsunami, what are the chances AT&T will be able to handle the load? I’d rather not count on them, to be perfectly honest, to help me communicate with family in a disaster.) Perhaps mesh-y networks that do not rely on too much pre-built systems like cellular base stations. Or, are there more esoteric warning systems, like these rattling cups? Hairs on the back of your neck? A forest of yammering, naddering wild life suddenly falling dead still and quiet? The color of the sky in the morning? Scattering insects all going in the same direction? A sudden feeling that comes from another array of sensors — ones not invented by scientists or technologists or relying on a functioning grid of power, communication and all that? What are the other “weak signals” of impending disaster, besides the news? These fictional moments in movie scenes popped into my head while thinking about early warning of impending disaster. Why do I blog this? Place marks for ideas related to early warning systems and the stories around them. Signals that are not explicit, but suggestive, providing some clues and cues that force one to be more attentive and resilient and resourceful. That’s the first one..is there another Jurassic Park moment I’m forgetting? How about a handheld tweeting twitter bird that activates when there is a earthquake detected on the magnitude that would start a impactful tsunami doesn’t the earthquake detection have the ability to distribute real time? how about to a satalight then down to the tweety birds!